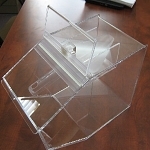 Acrylic Bins are just what you are looking for when you need storage containers for advertising foods and candy. If you are looking to attract sales and customers, add something with style, convenience, and finesse to your shops in the sweet treat department, bulk food sections and more. 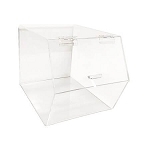 Clear Acrylic food bins are a safer way to display bulk candy and other dry foods without the worry of broken glass. Acrylic material is more durable, scratch resistant, and does not change in color over time yet still offers style and finesse to your display shop, candy store plus more. A clear see-through container is a great way to display unwrapped edibles to your customers. 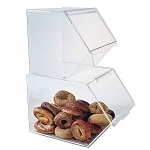 All Candy Containers offer a variety of food grade bins from square to rectangular shaped making them ideal for using as much storage shelf space as possible. The following coffee dispensers and candy containers not only have style but are extremely durable. 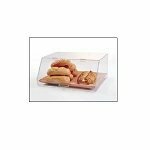 Check out our Angle Cut-Top Containers offering easy access to wrapped morsels on candy buffets, snack bars plus so much more. Use these popular bins for impulse items at your checkout lines filled with candy bars, snack crackers or key-chains and lighters. Scoop Bins are a must for your kitchen, cafe plus more. Are you planning to start a breakfast bar, or do you have a big family to feed? Come and see our cereal dispensers that spin on turntables offering four to six clear tubes for you to fill with dry cereal. 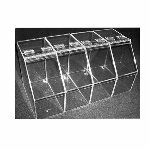 Rearrange your frozen dessert section by adding one of our various sized divided displays or our wide tiered display bins. Whether you need a candy bin or cereal dispenser, we've got you covered. 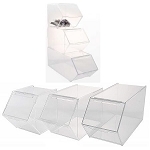 Need more than one of these acrylic bins? You are in luck as we have plenty in stock. Buying your wholesale containers in bulk allows you to save money. We have a variety of shapes and sizes to choose from. From divided bins to containers with lids, there are plenty of choices for you to consider. Acrylic dispensers also meet the requirements of most health departments sanitation rules, so you can comply while still having an attractive display option. 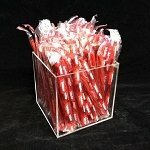 Choose from these acrylic containers for your candy displays and reap the profits you deserve.